I’ve been making many pumpkin creations recently, but what about apples? Oh, how could I neglect such a fantastic fall fruit? Inspiration struck in the middle of a particularly sweaty 6 am yoga class last Wednesday. 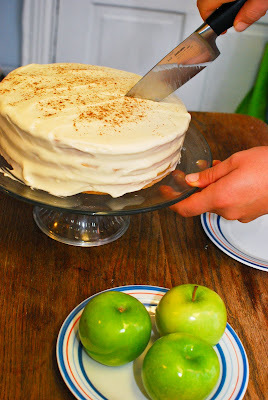 And then it came to me – a cake never done before – an Apple Cinnamon Layer Cake with Cream Cheese Frosting. Because everyone knows that the best part of a pie is its filling. 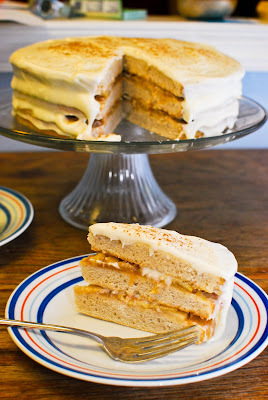 And what better way to use that filling than in a cake? 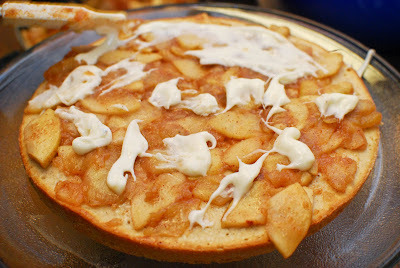 I think that cold apple pie is one of the world’s best creations. 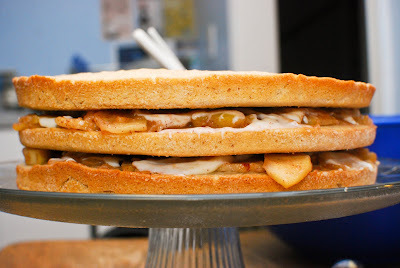 The way the flavors meld together in a gooey sweet but slightly tart mish-mash of pure appley goodness makes my mouth water! 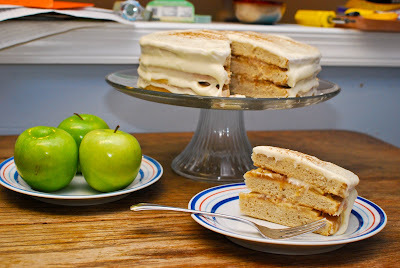 So that’s what I was going for in this cake – cold apples and light vanilla cinnamon cake, all covered in cream cheese frosting. I made the cakes in the morning, and I forgot to leave the butter out to soften overnight. So I put the stick in the microwave and accidentally nuked it too long! So the butter was melted, not just soft. This led the cake to be much heavier than it usually is (this is the same recipe I used for the Peach Chantilly Cake and the Oreo Cake). I know the recipe works – just don’t melt the butter and yours will turn out much better than mine! Fill 3 9-inch cake pans. 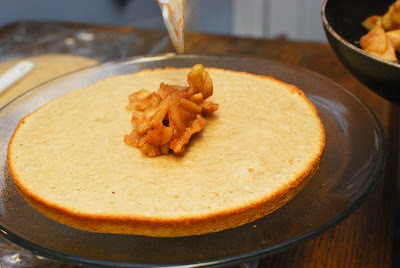 Bake for about 20 minutes or until a toothpick inserted in the center comes out clean. Cool the cakes for 15 minutes before removing from the pan. 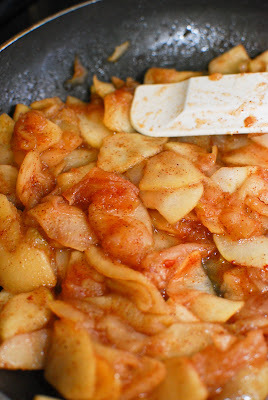 Sautee butter and apples over medium heat in a large saucepan until they begin to soften. Turn the heat to medium-low, and add the rest of the ingredients. Stirring occasionally, cook until apples are soft but not completely apple-sauce (about 15 minutes). 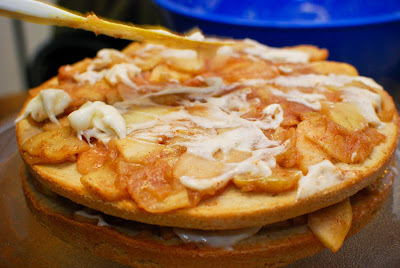 Cool completely and refrigerate (can store apples overnight). 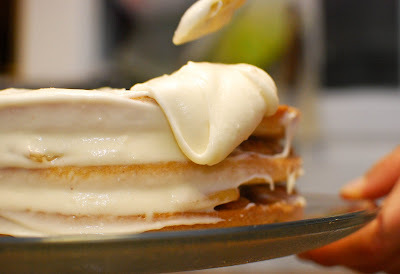 Cream butter, cream cheese, and vanilla. Beat in powdered sugar and add milk until frosting reaches a spreadable consistency. 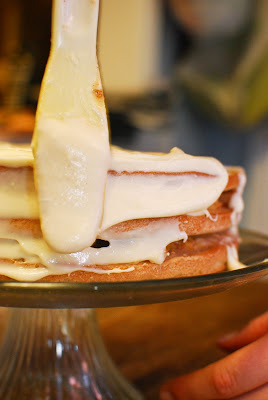 Choose the flattest cake layer. 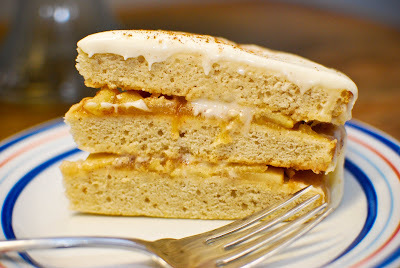 Spread it with half of the apple filling, and a few tablespoons of frosting. Repeat with the next layer. 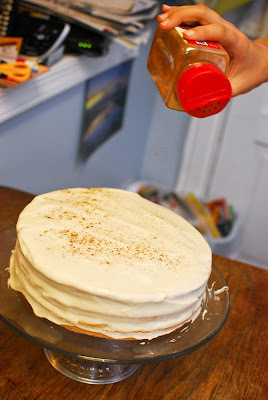 Cover the whole cake with the frosting. Let the cake set in the fridge for a couple hours for best results.